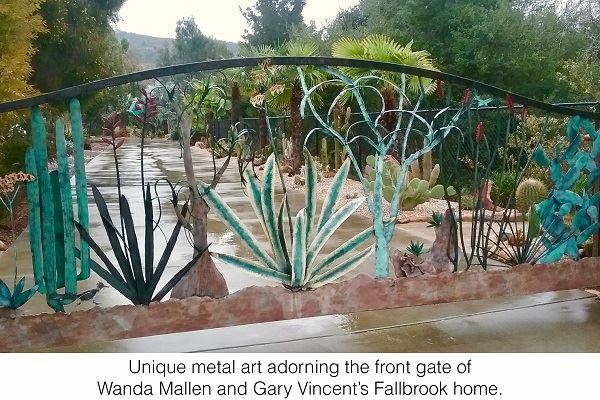 Wanda Mallen and Gary Vincent invite you to visit their labor of love in Fallbrook. As a prelude of what's to come, the unique metal art adorning the front gate opens up to the many surprises that lurk around every corner of this two-acre property. 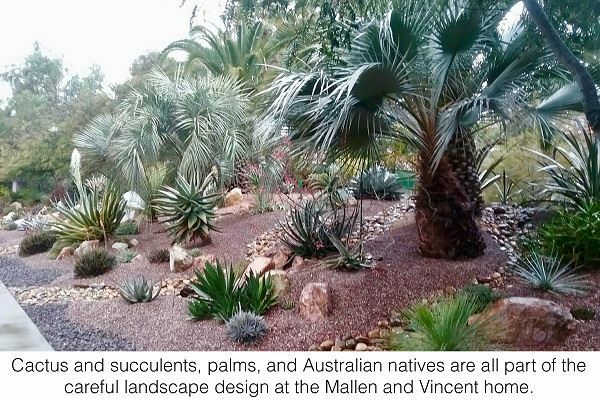 The garden has a large collection of different kinds of plants, such as cactus and succulents, palms, Australian natives, bromeliads, tropicals, and more. Fellow horticulturalists ooh and ahh over hundreds of rarities … But garden novices, too, often stop in their tracks, delighted by the garden’s many artful vignettes ablaze with bold color and novel accents, including stately Buddhas, Talavera geckos and birdhouses, benches and a tree house gazebo that Gary crafted. The owners will have some garden items for sale and provide light refreshments. There will also be a surprise vendor selling choice and rare succulents. Please bring cash. You don't need to register to attend, but you do need to register to get the address and reminder email messages.